Industry sources I spoke with regarding how to successfully develop a quick-die-change (QDC) strategy—one that management will buy into and your financial folks will approve—agree: Include your accounting department in your production-flow and die-change procedure overview right from the start. This will ensure that any funds needed to implement your plan, included those for purchasing new equipment such as clamps and die carts, get approved in a timely manner and allow your QDC production team to implement your great ideas related to QDC. And, including financial folks on the planning team will ensure timely definition of an acceptable justification formula at the beginning of the project, eliminating any back and forth proposal iterations that will undoubtedly delay the process. But where does the QDC team begin in its journey to reduce the time needed to transition a press line from last part off of an existing job to good first part off of the next project? Start with a detailed analysis of every single step required to transition the line from one job to the next. Other areas to focus on include ensuring the press cells are laid out to allow quick and efficient movement of dies as well as coils of stock in and out of the cell. “Look for s you can redesign the cell, perhaps by simply reorienting a conveyor or other pieces of equipment, so your die-change specialists can perform several operations simultaneously,” adds Drake. Yes, there’s plenty of equipment out there to help metalformers streamline their die-change processes. But before evaluating the new technology available and getting out the calculator to total up the amount of money that might be needed to purchase those items on the shopping list, the QDC team should review the step-by-step die-change analysis and watch the tape over and over. Its focus should be on looking for steps that can be eliminated from the process without spending too much money up front. 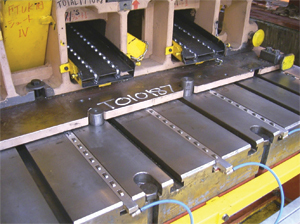 Stampers that standardize their dies as much as possible can more readily take advantage of a locating system like the one shown there with a system of clamps and die lifters. Many a 20-min. die changes has been extended to 45 min. or even longer as technicians search high and low for misplaced tools. Cure this all-too-common problem by establishing defined setup carts equipped with all of the tools needed to perform a die change, including extra clamps and hoses. Dedicate one or two or these carts and the tools they store only for die changes—buy an extra wrench or two if need be just so the die-change tool carts remain stocked and ready to go. “And don’t allow anyone—including maintenance or repair people—to remove tools from the carts,” says Drake. While sound scheduling practices will address the die-maintenance concern described by Richardson, Drake takes the notion one step further. “In terms of scheduling your pressroom and toolroom,” he says, “die changes can be performed more quickly and efficiently—with fewer steps—if shops get a from the concept that every die should be capable of running on every press. Your QDC team should look at your inventory of frequently run dies, and your presses, and categorize your dies based on size, tonnage required and the width of the material being processed. By earmarking certain dies for a specific press or perhaps a few presses, we see metalforming companies eliminating setup steps or minimizing the time needed to perform certain die-change procedures. For example, you’ll be able to use a locating system in the press with stops and pins to help your operators precisely and quickly locate dies in the press,” Drake adds. The time has come for stampers to evolve beyond manual die clamping, say Richardson and Drake, to not only speed die changes but to also safeguard workers performing die changes. Tasking operators with climbing up and around presses to install and manually adjust clamps is an accident waiting to happen, as is having workers pushing and pulling heavy dies in and out of the presses. While magnetic die clamping has long been accepted by injection-mold shops, metalformers just now are beginning to accept the technology as safe and efficient. “It’s a leap of faith for many,” adds Drake. 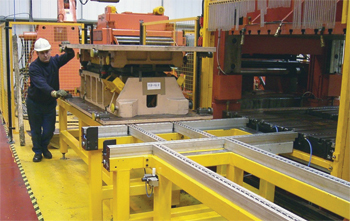 Also providing a safer die-change environment for operators is use of powered die-transfer mechanisms on die carts and dedicated die-change tables, rather than relying on multitasking fork trucks or overhead cranes that might not als be available when your press operator or die-change team needs one. “Die carts and custom-designed lift trucks for die handling can help ensure the press and die remain in perfect alignment during a die change—while removing one die and installing the next,” says Richardson. “And when moving larger and heavier dies, carts and trucks can be equipped with power transfer mechanisms to relive operators from having to push and pull the dies in and out.” Some die-handling trucks are even equipped with video cameras and monitors. Die carts also can be designed to handle both dies—the existing die being removed from the press and the new one being installed—in one handling, says Drake. “We can develop a double-decker die cart, or a side-by-side setup,” he says, to allow an operator to pull one die off and set up a new die in one operation, without any repositioning. You can’t do that with a fork truck or overhead crane, and lift trucks tend to cause a lot of damage around the shop. “And yet another option is the use of dedicated change tables,” adds Drake: “Set them by the press and roll a die out of the press, move it over and ro.ll the new die in. These tables can be fixed by a specific press, or mounted on casters or on rails to move from press to press. The Precision Metalforming Association offers a 90-min. webinar—Quick Changeover Simplified—that explains in greater depth many of the ideas covered in this article, including how to prepare an employee project team, establish a baseline and standardize your equipment and procedures. Archived for download at www.pma.org/webinars/past-webinars, it’s presented by Fletcher Birmingham, president of Summit Business Consulting, Inc. Price: $100, $75 for PMA members.